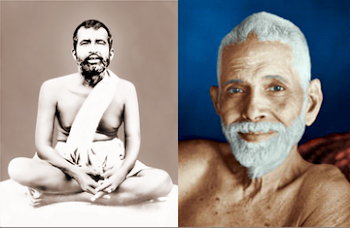 Sri Ramakrishna to M: "How are you getting along with your meditation nowadays? What aspect of God appeals to your mind — with form or without form?" Sri Ramakrishna: "Now you see that the mind cannot be fixed, all of a sudden, on the formless aspect of God. It is wise to think of God with form during the primary stages." Sri Ramakrishna: "Why clay? These images are the embodiments of Consciousness." M: "Even so, one must think of hands, feet, and the other parts of the body. But again, I realize that the mind cannot be concentrated unless one meditates, in the beginning, on God with form. You have told me so. Well, God can easily assume different forms. May one meditate on the form of one's own mother?" Sri Ramakrishna: "Yes, the mother should be adored. She is indeed an embodiment of Brahman." M. sat in silence. After a few minutes he asked Sri Ramakrishna: "What docs one feel while thinking of God without form? Isn't it possible to describe it?" After some reflection, Sri Ramakrishna said, "Do you know what it is like?" He remained silent a moment and then said a few words to M. about one's experiences at the time of the vision of God with and without form. Sri Ramakrishna: "You see, one must practise spiritual discipline to understand this correctly. Suppose there are treasures in a room. If you want to see them and lay hold of them, you must take the trouble to get the key and unlock the door. After that you must take the treasures out. But suppose the room is locked, and standing outside the door you say to yourself: 'Here I have opened the door. Now I have broken the lock of the chest. Now I have taken out the treasure.' Such brooding near the door will not enable you to achieve anything. "The jnanis think of God without form. They don't accept the Divine Incarnation. Praising Sri Krishna, Arjuna said, 'Thou art Brahman Absolute.' Sri Krishna replied, 'Follow Me, and you will know whether or not I am Brahman Absolute.' So saying, Sri Krishna led Arjuna to a certain place and asked him what he saw there. 'I see a huge tree,' said Arjuna, 'and on it I notice fruits hanging like clusters of blackberries.' Then Krishna said to Arjuna, 'Come nearer and you will find that these are not clusters of blackberries, but clusters of innumerable Krishnas like Me, hanging from the tree.' In other words, Divine Incarnations without number appear and disappear on the tree of the Absolute Brahman. Please share this evening aarti song of Shri Ramakrishna. Its overwhelming and awesome.